Super slim electric water heater is with slim shape and can be installed even in the smallest room. Operation principle is simple: water in the tank is heated by electric heating element installed within the tank. As a vertical water heater supplier, our company offers advanced technology to save electric power remarkably and supply hot water instantly. Super slim electric water heater can be divided into vertical type and horizontal type. It is for household use and with capacities of 30L, 50L, 60L and 80L. 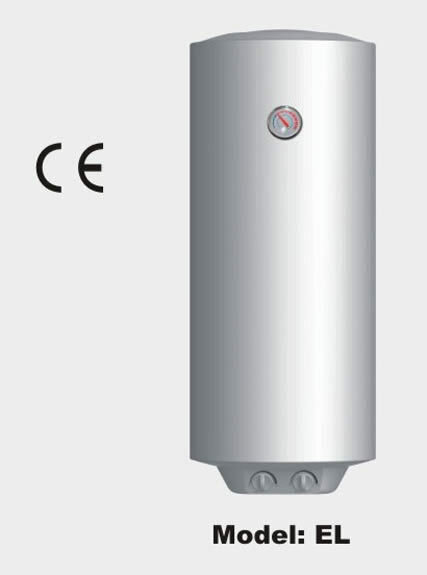 As a vertical water heater supplier, our company offers the water heaters with the best quality. 2. It adopts stainless steel heating pipe with high power of 2.0 kW. 3. There are heat waters with powers of 500W, 1500W and 2000W for you to choose from. 4. Super slim electric water heater is with precise temperature controller and durable metal outer casing. 5. It can protect against overheat, electric leakage and heating without water. 1. As a vertical water heater supplier, our company adopts advanced technology to heat up water instantly and minimize energy consumption. 2. It is endowed with high performance electric heating element. 3. High resistance to corrosion and long working life. 4. It is with perfect protection against heat loss. Take water consumption into consideration when choosing water heater. For example, 30L for two people, 50L for three people, 80L for four people, and so on. Electric circuit must be safety circuit with ground wire, and be installed on solid brick wall. 1. Please do not use water mix valve. Otherwise, cold water and hot water will flow out together when turning it to the middle, then the hot water flow will get smaller, and water heater will be overheated. As a result, water temperature may be out of control, for hot water will alternates with cold water. 2. Take control of water flow. Sprinkler provided by manufacturer shall be adopted when installing 30L super slim electric water heater. It can adjust water flow or increase gear to raise water temperature when water heater performs well. 3. Install filter screen. Tap water contains little impurities. In order to avoid magnetism and sprinkler get stuck, disassemble and clean the filter screen periodically. 4. Please turn off the inlet valve and power supply when not using it for a long time. Accessories of Super Slim Electric Water Heater Relief valve, wall hung screws and nuts.